We’ve witnessed several standout performances in Russia over the last month: the host nations’ very own Denis Cheryshev showed Real Madrid what they’re missing when hitting the net with numerous fine strikes, England players such as Kieran Tripper and Jordan Pickford have shown the wider football audience that they belong at the top, French teenager Kylian Mbappé has tormented defenders, leaving them in his wake on route to the final, while Les Bleus captain and goalkeeper Hugo Lloris has shown his brilliance with a string of outstanding stops. However, no one has impressed more than Croatia’s Luka Modrić. It took Croatia a while to wrestle control of their semi-final against England, but the cream soon rose to the top, and by early in the second-half, Modrić was pulling the strings. Had the midfielder had an England shirt on, it’s likely that “football’s coming home” would still be echoing its way through the streets up and down the country ahead of a France v England final, such was the effect of the little man in the middle. Rarely will you find a player who doesn’t divide opinion, even the biggest names have their critics, though you’d be hard pushed to find anyone, anywhere who doesn’t rate Real Madrid’s Croatian playmaker as one of the very best in world football. Fans, players and pundits alike never have a bad way to say about the midfield maestro, who continues to deliver performances of the highest order almost every time he walks onto the pitch. His team mates love him, his opponents pay him the utmost respect: legendary Ukrainian striker and Ballon d’Or winner Andriy Shevchenko hailed Modric as “one of the greatest midfielders ever to play”, while former Croatia player and manager Slaven Bilić said “Modrić is a complete player, who looks like he was born with the ball at his feet”. In 2016, Atletico Madrid captain Gabi stated that even in a team filled with star-studded names such as Cristiano Ronaldo and Gareth Bale “Modrić is Real Madrid’s best player, he’s the one who makes them play and gives the team balance”. Compared to Andrés Iniesta, who is arguably the greatest Spanish player of all time, because of the control he exerts over the game with his intelligent play, much like a conductor controlling the orchestra, Modrić has led by example in Russia this summer. His excellence on the pitch isn’t a new thing, people have been taking note of the magician’s performances for the last ten years, but fans, players, officials, managers and basically anyone who has been watching in Russia or on television around the world has had no choice but to sit up and applaud the performances of Croatia’s talismanic number ten at this World Cup. A player who combines supreme technical ability and an extraordinary football intelligence with a tireless work ethic, Modrić, who by covering no less than 39 miles on route to the final has run further than any other player at the 2018 renewal of FIFA’s flagship event, has put himself in the driving seat to claim the prestigious Golden Ball award. Even if Croatia fall at the final hurdle and are beaten by France, it would be a surprise if the diminutive Croat failed to scoop the award for the tournament’s best player. The Golden Ball may not be the only individual award on the horizon for the most accomplished footballer ever to pull on Croatia’s famous red and white checked shirt. Having already played a key role in Real Madrid’s fourth successive Champions League win, a World Cup win could mean that greater riches are around the corner for Modrić. In fact, simply by leading his country, who were ranked 20th by FIFA prior to the tournament, to the final, the 32-year-old must be a front-runner for the Ballon d’Or. It’s almost ten years since a player other than Cristiano Ronaldo or Lionel Messi won football’s most prestigious individual award, though Modrić’s standout performances for both club and country over the past twelve months could mean that CR7 and LM10’s dominance, which has spanned the last decade, is close to an end. In 2010, after being fundamental to Spain’s World Cup triumph in South Africa, the footballing collective were shocked when neither Andrés Iniesta nor Xavi, who’re perhaps the only two midfield players to match Modrić in recent times, didn’t win the Ballon d’Or. Even Lionel Messi, who claimed the prize, admitted that he believed either one of his Barcelona’s team mates should’ve won. However, with Modrić’s performances and achievements surpassing even those of Xavi and Iniesta, surely FIFA won’t make the same mistake. Categories: Blog, Football, and World Cup. Tags: croatia, Luka Modric, and world cup. 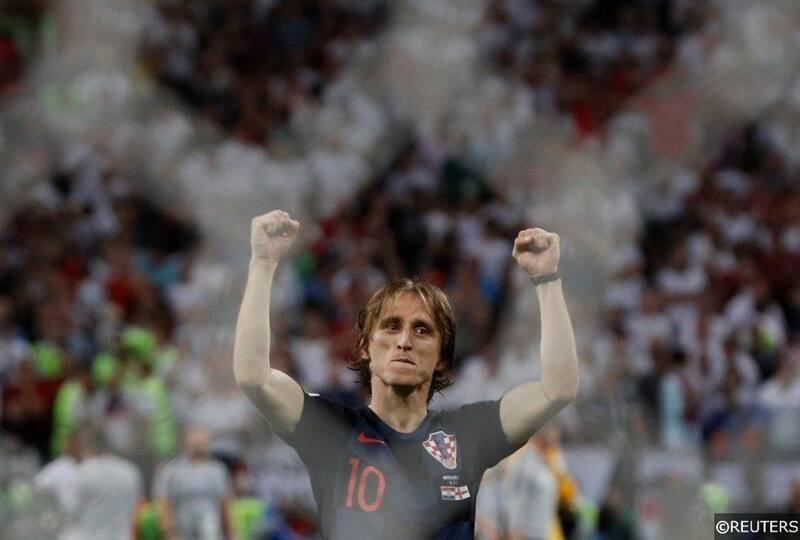 Team Tag: Croatia, Luka Modric, and World Cup. League: FIFA World Cup 2018. Sports: Football.